Susie is a very unusual young woman. Like a lot of people her age she likes makeup, music and handbags – and she wouldn’t be without her mobile phone! She’s also a qualified beauty therapist and has a BTEC National Diploma in Business Administration and Law. 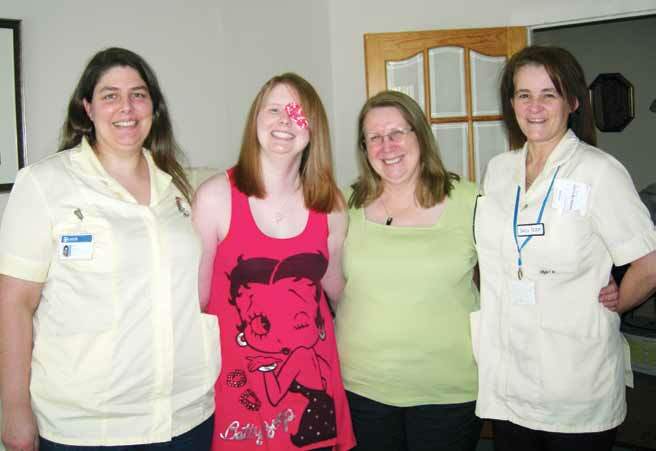 Kathy and Elaine from the team helped Susie regain some confidence with things like using the oven and showering. She also has various pieces of equipment such as a falls bracelet, perching stool, pills dispenser and even a talking jug! The teamwork is obvious, with a holistic approach to the support for Susie. “We do get involved with the family as well,” says Kathy. Wendy, Susie’s mum, is very pleased with the speed at which thing happened once the SkILs team became involved. Everyone is pleased with Susie’s progress; from lacking in confidence using the oven and needing help in the shower, Susie is back to baking and cooking and showering by herself.